I fixed it for myself, but thought it should be addressed in future versions. thank you for reporting the issue and thus helping to make this CMS better. Have you applied the changes from the files I updated? If you'd like to check, that'd be cool. I don't have experience with github, but I am more than happy to check. I assume I just manually open each of those files and remove anything that is highlighted in red and add anything in green. There were indeed some other hard coded headlines (they are replaced by JS for showing either "add" or "modify"). I've changed them too. To answer your question, you can either apply the changes manually (right as you wrote, replace the red highlighted lines with the green ones, without the + / - in front of them of course). Maybe it works too, if you download the whole package, unzip it locally and replace the single affected files manually, but take care, there might be issues because they are for the upcoming version of WBCE. as I am still seeing hard coded language and missing Cancel. I am going to assume that by saying that, you are letting me know that it is a more involved fix to go through and patch everything manually... and that you suggest I wait until the release of 1.4? If that is the case, I am cool with that. I just want to know if that is what you are saying. I am sure I followed all the steps (I've checked my changes a few times now), but if you are saying I must have missed something, I am happy to go through it all again. I understand this is a very busy time for the developers. 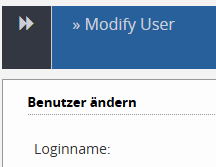 Did you also modify the users_form.htt and groups_form files in the backend theme directory? Right before the end of file the headline is replaced with jquery. Did you replace the hard coded german string there? The missing "cancel" was forgotten in our first approach to correct the issue, this has indeed to be fixed (added) in the /admin/groups/groups.php file. If there are further issues, I would indeed propose you wait until the release of 1.4 and update your site(s) then. It won't take very long any more, I hope. I did not see those particular changes in the github. But, I did search around and found those and was literally just working on that script section. Both are corrected now. Thank you for following up. I will try to fix the missing cancel for myself and let you get back to work. Got the "Cancel" added in. thank you both so much for taking the time to help, Looking forward to the future of WBCE.